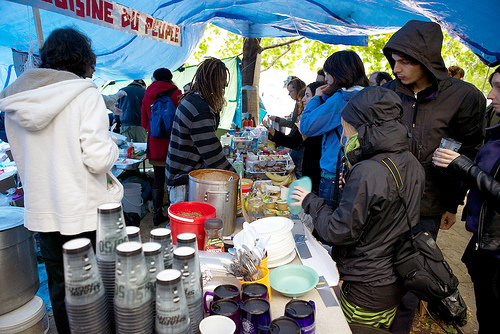 Since the start of the #occupy movement, whenever I had the chance to engage in a deeper conversation about the movement with active members, with journalists, or simply with people passing by the #occupy Montreal camp, where I was very active, I tried to put the movement in the broader context of what we call the multitude constructive revolution. To my surprise, almost everyone was clueless and probably saw in me signs of insanity, because I was speaking a language they were not familiar with. Only a very few surprised me, being able to absorb very quickly the information I was trying to convey, agreeing with most of it. Those individuals had one thing in common, they were very close to the software world. They understood the influence of the new technology in shifting the balance of power towards individuals and their communities. What do we hear when we listen to the forgotten U.S. nation-wide End the Fed movement in 2008, which sparked the TeaParty movement, or to the so-called Twitter revolution in 2009 in the Republic of Moldova, or to the 2009-2010 Green Revolution in Iran, or to the Arab Spring, or to the 15-M movement in Spain, and now to Occupy Wall Street and to Occupy Everywhere? We hear a desire for change. Not any change, people want a PROFOUND structural change. The multitude is now awakened thanks to the new media. We are now conscious of our situation and we are starting to imagine a better world. Moreover, the multitude becomes increasingly aware of the potential of the new democratic digital technology. As we experiment with it in various creative ways we grow confident, we grow empowered, we get this feeling that change IS indeed possible and that WE can make it happen. From the forgotten U.S. nation-wide End the Fed movement in 2008 which sparked the TeaParty movement, to the so-called Twitter revolution in 2009 in the Republic of Moldova, to the 2009-2010 Green Revolution in Iran, to the Arab Spring, to the 15-M movement in Spain, and now to Occupy Wall Street and Occupy Everywhere, the Multitude has made tremendous progress in realizing the liberating power of the new technology and in putting this technology to good use in its struggle for freedom and self-determination. We are now seeing an important transformation in the way social forces organize and oppose each others. This transformation is gradual, as different social factions realize the potential of new emerging technologies, and experiment with them. Science and technology are blind; they serve better the ones who know how to use them. But knowledge about a new tool or method is not everything, social factions also differ in their disposition to receive and integrate the new technology. Their disposition can be related to a cultural specificity, their organizational structure, their leadership, etc. All this plays a role in how fast a group can actualize a new potential. (...) Activists and organizers of social mass movements are starting to think in a radically different way. Networks is the key concept. We are moving towards a highly decentralized form of social movement organization, a very organic and dynamic structure. Read the Balance of Power. The Occupy Everywhere movement is the synthesis of all the other movements before it. In a post published on Coalition of the willing blog Tim Rayner brilliantly explains the Occupy movement in the US. "The protesters in Liberty Square and across the US are engaged in a more serious business than contesting dominant institutions. They are knitting together new cognitive maps based on peer-to-peer strategies and open source ethics and reworking politics from below. (...) All that remains is that the movement finds a way of articulating its power without reducing its intrinsic diversity. If OccupyWallStreet can achieve this, it could literally change the world. Let's imagine a scenario and try to assess how fast the multitude could demolish the system. Hypothetically speaking, the act of personal bankruptcy can one day become an act of rebellion and spread like a wildfire throughout the world. What would be the consequences? How possible is this? What keeps people that are in debt up to their eyeballs from declaring personal bankruptcy? Violent flash mobs, how should we understand it? What should we make of these swarms or flash mobs? When you are living in a society that you perceive as being unjust, unfair, when you're unable to dream anymore about a brighter future, when you feel trapped within a cycle of poverty, when you perceive that the society you live in is not yours, what incentives do you have to preserve order, to respect the commons or the property of those that you associate with the higher casts? As the chasm between the haves and the have-nots deepens, the tension also increases. This tension was kept under control through psychological and physical means. We tell young people that destroying property or steeling is not good, and hope that they will voluntarily behave in a moral way, moral as defined by the establishment, camouflaging the systemic injustice. When that is not enough, when the pressure is too large, when the injustice becomes obvious, when people decide to act against the haves indiscriminately, "we" send in the "security" forces (security mostly for the rich, less for the poor). The problem is that current "security" systems were not designed for a coherent and well-coordinated mob, which is now awaken by alternative information sources. The traditional psychological and physical means of control are breaking down! The answer is NOT more brutal force, but a more just society. Social stability, as defined by the upper class, is not sustainable anymore for a large gap between the haves and the haves-not, because the classical means to sustain it are now inappropriate, ineffective. This is the multitude social revolution, the emancipation of the masses, a natural transition towards a more just society that plays on the unbalance of power in the favor of the multitude (see The multitude page on our website). The answer is to let the masses emancipate, to let them participate, to provide people with a sense of belonging, to provide them with real opportunities, to give them a reason to respect the commons and the property of others, because they feel that in doing so they help build a society for themselves. Otherwise people will passionately destroy the assets of those who they perceive as being part of the oppressing class, or participating in the oppressive system, if they are pushed to their limits, because they can. Yes, they can... and there is nothing in place to stop them! "the police are getting quite savvy in heading off these gatherings before they come to a head, they are routinely monitoring Internet websites, including in particular social networking sites..."
How much resources does the police have to play cat and mouse with the disenfranchised, jobless youth? "Why they [violent flash mobs] happen? ...kids being bored and acting stupid"
Swarm of flash mobs, or any other type of decentralized, spontaneous, and well-coordinated massive action are a reality. We saw them coming by analyzing the possibilities introduced by the new technology. They can target positive as well as negative action. The only effective way to reduce negative action is by giving people a reason not to engage in it. We cannot prevent it by force. The multitude is the power, and it will move in one direction or another depending on the signals it gets form the environment. A more just society will generate dynamically stable attractors characterized by positive action. See also the article on Pre-programmed mass movements on our website. London, England: "Just to show the rich people that we can do what we want..." video bellow. Multitude Movement, from a theoretical perspective - beautiful! To put it bluntly, to my ear "crowdsourcing" sounds like "flock milking". I don't like the term and I don't even like the concept it stands for. But there's more than what I personally like or dislike. I believe that this concept is not going to survive for too long. It will be operational in the transition period between the old and the new economy, mainly instantiated in corporate activities, as corporations try to utilise the new technology to their advantage. But it will gradually fade away as open value networks will replace closed hierarchies. See history of the term and concept on Wikipedia. In fact, we can see that this concept evolved from outsourcing, which is part of the old language, with a well defined meaning within the old paradigm. Outsourcing is in fact externalizing some processes, which implies a clear boundary between in and out, between us and them. Moreover, this externalization is NOT a symmetrical relation, the outsourceE has an information disadvantage and is sometimes economically dependent on the outsourceR. Crowdsourcing comes from the realization that companies (i.e. closed and hierarchical (feudal) organizations) can use the new technology to coordinate input from a very large number of entities, including a mass of individuals, the crowd. The relation remains asymmetrical between the outsourceR, a closed, intrinsically individualistic organization and the outsourceE. The only thing that changes is the nature of the outsourceE. Instead of being one entity (individual or organization) executing a particular set of tasks, it is now an informal group of individuals, the crowd. In the eyes of the outsourceR the role of the outsourceE is the same. Although the different nature of the outsourceE forces the outsourceR to slightly modify its practices. A company creating and maintaining it's own crowd for harvesting - the case of FIAT and its Mio project. In both cases, the crowdsourcing concept supposes a powerful entity (the outsourceR or the matchmaking service provider), which has some advantage (informational, logistical, financial, economical...) over the crowd, and the crowd, which is seen here as disorganized but resourceful. It is implicitly assumed that this powerful entity is necessary to channel potential out of the crowd. In other words, the crowd alone is seen as incapable of producing a coherent output. For that matter, and for others too, it seams justified for this powerful entity, acting as a center of analysis and coordination, to keep the biggest part of the reward/revenues and to reward the crowd just enough. When it comes to motivation, there is a fundamental difference between outsourcing and crowdsourcing. The outsourceR has more influence over the outsourceE than over each individual in the crowd. Moreover, negative incentive doesn't work on the crowd. The outsourceR must become seductive, attractive and must give something in return, something that the crowd likes. In some cases the crowd asks for the knowledge behind the product to be public, and this leads to a variety of open innovation and open products. This variety of open innovation is not based on altruistic sharing. It is very individualistic, based on the realization that hyper-innovation (which is unleashed by crowdsourcing) is economically more viable than a defensive tactic based on intellectual property protection. Structurally speaking, a crowdsourcing network is highly centralized. The multitude movement that we are observing is a movement that empowers the individual. We are all waking up realizing that we have power as individuals AND as groups. We are also realizing that power relations are not necessary anymore to organize ourselves into large and productive/efficient groups, if we have at our disposal effective means of communication and coordination. Hence the growing tendency to form decentralized networks rather than hierarchies. In fact, it is possible for a decentralized value network to self-structure and to produce a very complex output. We don't need that powerful entity to analyze and coordinate action. That entity has lost its power, because it doesn't play a necessary and irreplaceable role anymore. That entity is still strong today, because it still has under its control important assets and capacity of production. But these things are now being transferred to the crowd. So we don't need a corporation to milk the crowd anymore. The crowd can deliver by itself. SENSORICA, the open value network that we are setting up, is an example of a system centered around the individual and its capacity to work in collaboration. SENSORICA is not an entity exploiting the crowd, it is the crowd creating solutions for its own problems. It's mode of production is commons-based peer production (Yochai Benkler). Open source communities don't "source" the crowd, they are the crowd working in collaboration to produce something, one entity, one system. They are not lead by any other entity. They are self-oriented and self-governed entities. So let's make it clear, crowdsourcing and commons-based peer production are two very different things! Chris Cook - Capital Partnerships: A Debt Free Solution to the Property Crash from Feasta on Vimeo. Steve Bosserman introduced the idea of "Production Centered Local Economies", and "People Centered Local Economies". This article synthesizes Steve's coining of those terms, and uses concepts developed by Sam Rose, Paul Hartzog and Richard C Adler of Forward Foundation to further explain the differences between these economies, from a business development perspective. In fact, "People Centered Local Economies" is what we would call "Multitude Economics". Marcin Jakubowski - part 1 from East Bay Pictures on Vimeo. Evgeny doesn't consider the innovation, production and distribution side of the new technology. It is not guaranteed that the young generation will use Internet to influence politics, BUT something even more powerful is happening. The younger generation understands how to use the new tools of communication, coordination, and collaboration to create and to distribute value! The open enterprise is emerging and all kinds of open currencies are being created. This will shift the economical power from centralized power clusters to the multitude, and the politics will follow naturally. This is what we call a constructive revolution. Change the substance of society, the way value is created and distributed, and you will change the power structure. Who said we can't sing our way into the future? ProM, a sub-project of the Coalition of the Willing is designing the infrastructure to support the next level of social organization with the help of the new technology. The ambition of ProM is to match different organizations according to their affinity to collaboratively tackle complex projects, and to provide the tools to enable these organizations to interface with one another, to share resources, to formulate new visions, to plan and to execute. 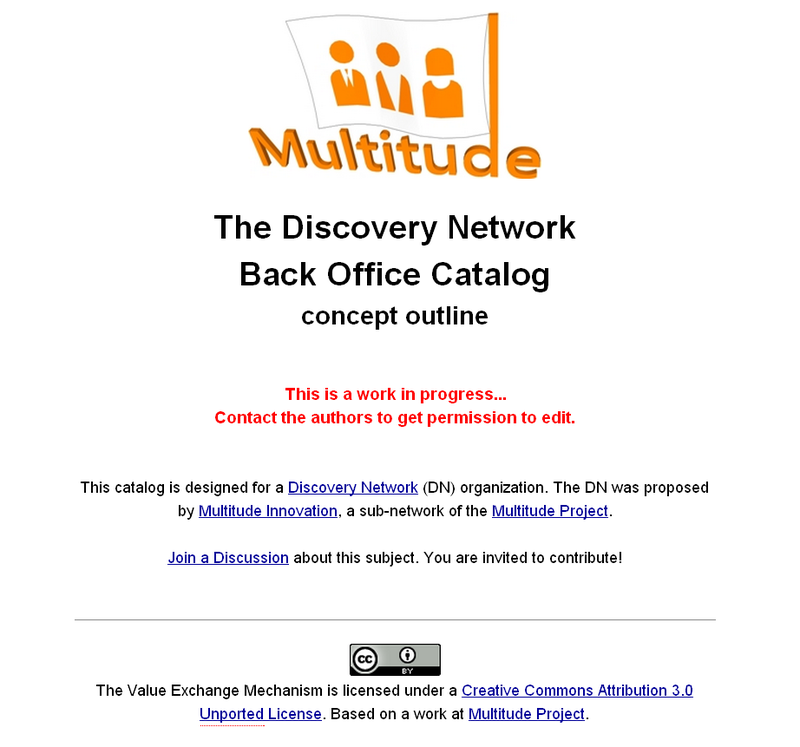 Multitude Project is active at the very core of this world changing project. The problems we are trying to solve are far from being simple. The web2.0 revolution has provided the infrastructure allowing individuals to organize into large collaborative networks, undermining the monopoly of creation and distribution of value, until now hold by hierarchical institutions, and transferring power to the multitude. We want to make possible for these networks to coalesce into super-networks, being able to take on the most ambitious projects humanity has ever dreamed of. We believe that this new infrastructure designed by ProM will unleash the power of the crowd like never before, surpassing in capacity any existing hierarchical organization, including governments. ProM is envisioning a web2.0 on steroids. A successful ProM-driven web2.0 RErevolution would complete the metamorphosis of our modern society, would complete this structural transformation from a state in which the multitude is merely equivalent to means of production, to a new state in which the multitude takes the leading role in innovation and creation. An infrastructure allowing complex layers of organization in which the individual still holds the key position would represent the backbone of a new society in which the power truly resides within the multitude. ProM is building itself on the already existing social structure around environmental issues. It's first alpha applications will be customized to be tested within this same space. But this "infraSUPERstructure" will be made generic. It will also be directly applicable within the innovation space. 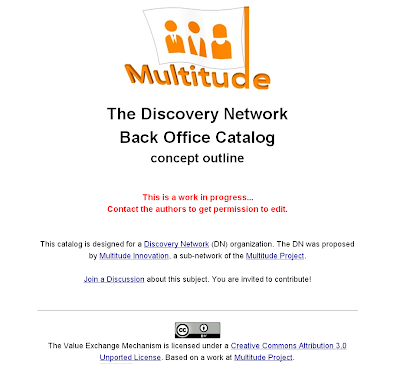 Multiple Discovery Network-type open enterprises (decentralized and open organizations for innovation, production and distribution) will be able to coalesce into super Discovery Networks with tremendous capacity, empowering the individual creator, giving him his proper place within our economy, wile respecting each other and our environment. In other words, ProM applied in the space of innovation and production will render obsolete closed, secretive, competitive and profit-driven power-based structures like corporations, which constitute environments breathing social and environmental injustice. Our modes of production and consumption will be radically changed by restructuring the set of incentives and constraints which traps the worker as well as the consumer. We have created an online space for you to contribute your ideas and experiences. You'll find it here. It would be wonderful if you could take ten minutes to share some insights. No need for anything fancy. Anything that you can offer us will be greatly appreciated. Coalition of the Willing is a volunteer-based network organization, If you have questions you’d like to ask about Coalition of the Willing or ProM, or if you'd prefer to share your experiences by email, drop us a line on helloprom@gmail.com. If this project excites you, you can get involved in a deeper way by joining the ProM team. This is a playlist of 4 videos that explain the link between value creation and distribution and social structure. The new technology introduces new possibilities in terms of innovation, production and distribution of value. This will have a fundamental impact on our society. In this video series Tibi thinks out loud about why Multitude is a transformative constructive revolution. This document is addressed to policy reformers, citizens and free/libre culture activists to provide them practical tools to actively operate this change. The Multitude Movement was accelerated in recent years by the introduction of a new potent technology, which induces fundamental material changes, new possibilities, and transforms the way value is produced and distributed in our society. It is a natural and inevitable process, a pragmatic revolution, a constructive revolution. Some scholars attache great importance to the invention of the birth control pill in the feminist movement. In essence, it is a technology which gives women the choice to keep or not to keep their unborn baby. Without minimizing its ethical implications, the point I want to make is that this pill introduces a new material possibility, a new alternative for women, making them able to decide if they engage or not in a long-term relationship with a man. It fundamentally changes the relationship between a man and a woman. Once this pill is made available it operates irreversible social changes, as women realize the shift in the balance of relational forces, which is in their advantage, and massively adopt a new attitude. The Industrial Revolution was set in motion by the electro-mechanical technology, which fundamentally transformed the way the economy worked. The leading societies at that time went from an agrarian economy to a predominantly manufacturing economy. As the new means of production and distribution of value were spreading, the locus of economical power shifted. The small artisan became the manufacturer and snatched the political power from the hands of the landlord, to share it with other players occupying key positions within the new economical system, the bankers, the energy producers, the distributors, etc. Together, they changed society by creating new institutions tuned with their new reality. There was no ideological bases to the industrial revolution. It was a natural and inevitable process set in motion by a new technology, by the introduction of new material possibilities. We can say that the French revolution was mostly ideologically driven and contained the seeds of the new industrial order. But because the material conditions were not there when it happened it rapidly degraded back into tyranny, and went back and forth a few times until it finally took roots. The technology behind the new wave of the Multitude Movement is one that enables efficient circulation of information and that enhances coordination throughout society, down to the level of the individual. The material possibilities it introduces are one-to-one, one to many and many-to-many exchanges of all sorts, and massive collaboration with no geographical barriers. It creates the possibility for open and decentralized collaborative systems to emerge as an alternative to closed hierarchies, for the production and distribution of value. Its effects are to empower the individual, to set us free from centralized and monopolistic systems. By allowing different forms of organization and by creating an environment in which sharing and openness are rewarded, the new technology changes the way value is created and distributed in our society. Economical power is shifting hands, NOT by putting new people in charge of the same levers of power, but by dissolving the classic levers of power and by creating new ones, for a newly emerging system. Old processes are overpowered by new ones. Those who are still in control of the old ones will soon find themselves powerless. Ideological revolutions that are not based on changes in material possibilities, like the Bolshevik Revolution for example, are basically a fight between different social classes for the control of the same levers of power. They entail a direct confrontation to control the same means of production. The new wave of the Multitude Movement is not in direct opposition to the establishment. It develops on a newly emerging parallel structure, which gradually replaces the old one. The Multitude Revolution is a pragmatic revolution. Most people engage in it without even realizing. They are naturally drawn towards the new things simply because they find value in them. We go to Wikipedia because we find it convenient and useful. We stopped watching TV because we find more substance in alternative media. We invest in solar technology because it is cheaper, convenient and it sets us free from the centralized and monopolistic systems of energy production and distribution. We use alternative currencies and financing mechanisms because we get a better deal than at the bank. We use Gnu/Linux because it is more robust than Windows. Every time you engage in the creation, improvement or maintenance of democratic and popular systems that allow peer-to-peer exchanges you contribute to the Multitude Revolution. Every time you chose to use such systems over the other ones you contribute to the Multitude Revolution. Multitude Project's mission is to raise awareness about this movement. View more presentations from ChrisJCook. "Many of the relative advantages of hierarchy are now reduced." The informational advantage of hierarchies is reduced. Institutions have lost their monopoly on tight management of information and thigh coordination of action. Now large distributed groups can share information and coordinate through social networking. This increases individual power and group power! This is the Multitude social movement!